Vurp‘s allied side had a strange warlord named Lord Hamster. This warlord was strange in more than one way. Lord Hamster did not ask him about that feeling, however. Lord Hamster‘s second strangeness was that he was not Chief Warlord any more, even though he had made his side very strong when they were very weak. He was like Vurp in that way. So he should have been a Chief like Vurp. He thought he should ask Lord Hamster “How do you feel about that?” But he did not. Vurp was not strange in that way. Natural Allies know the will of their tribe‘s Chief or Chiefs by Natural Thinkamancy, even from other hexes. Tribes have no purse and keep no Shmuckers. When they are in an alliance, their allied side pops rations for them from its treasury. But a feral tribe must hunt or gather or farm or mine. Lord Hamster did not know any of this. He wrote it down to remember. Strange. Lord Hamster also asked more than one question about making alliance and breaking alliance. Vurp told him that the Chief or Chiefs make such decisions. Such decisions are serious. Changing such decisions is also serious. A tribe prefers to stay with their allied side for good, if the side allows it. Vurp believed in the wisdom of this. His tribe was now very strong, because he had stayed with Lord Stanley, even until he was the only one left. Vurp had more than one feeling about Lord Stanley. After more than ten turns, Vurp still had that feeling. I think it's pretty obvious that Charlie was involved in Saline's fall. I think the opposite, that's it's pretty obvious Charlie was not involved in Saline's fall. If he had that kind of pull over the Hobgobwins, why would he have left them with Stanley? More importantly, what is Charlie's motive behind having a side allied with GK kill its ruler and then stay allied with GK afterwards? Charlie's motives in tempting the Western Giants to join Jillian are easy to understand, but if Charlie is the mastermind behind Stanley's rise to power, then his motives are utterly inscrutable to me. Do we know if the fact that Stanley was heir was common knowledge? Try this (WAG) scenario) Charlie wants the Arkenhammer but can't be seen trying to grab it for himself. King Saline IV is weak in combat. Stanley leaves GK and takes the majority of it's combat power with him. Charlie organizes the uprising, Saline IV can't fight off the gobwins and is croaked. Charlie expects all forces outside GK (Stanley) to promptly depop, the Arkenhammer falls to the ground and a Archeon flies in to pick it up. That's not what happens however, Stanley is the heir, becomes the sides new ruler and promptly retakes GK. Charlie can't pull the same trick again because Stanley is much more powerful in combat and there would be a good chance he'd simply croak the gobwins solo or stanley never stripped GK of its defenses again. Sizemore also said that he and Stanley were off on a special mission when Faq fell, so Stanley can't have been directly involved in the regicide in any case. Unless Sizemore was lying, but that then raises a heck of a lot more doubts than what Stanley was up to the day Saline died! I don't see why there's so much confusion and speculation. My personal impression was that Stanley arranged with the gobwins (hob and regular type) to break alliance while he took the casters on a 'special mission'. Stanley took all the casters with him so that there was no one to defend Saline when the gobwins broke and attacked him. Stanley then became the overlord of Gobwin Knob. Maybe it wasn't Stanley's idea. Maybe it was Wanda's idea. Maybe it was Charlie's idea. Is there any way to tell? No. You can build elaborate hypothesis on top elaborate hypothesis, but none of it stands or falls on its own merit, just how the story unfolds. We only know that it is an interesting plot point because the text update reminds us of it. Just keep it in mind as the updates roll in. We're thinking Charlie is involved in that now? 1) The Gowbwins/Hobgobwins are natural allies to GK. 2) Turning Natural Allies is very rare. Do we KNOW Charlie was responsible? No. Is there a lot of circumstancial evidence implicating Charlie? Yes. Is Saline's fall important to the grand plot? Obviously, Baldur is telling us Yes. It is probably unlikely that Stanley was involved directly in the plot against King Saline IV. He was not just the Heir Designate but ALSO the Chief Warlord. Duty affects all warlords/commanders - Chief Warlord most of all. He cannot withold information and cannot conspire against the ruler. So.. unless Stanley justified offing Saline for the 'greater good' then he was just being used by Wanda or Charlie or whomever. My thoughts on who is responsible have me asking "Cui Bono?" Who Benefits? So far very good arguments have been laid out for both Wanda and to some degree Charlie. Maybe there was some unmentioned benefit for the natural allies as well. TIme will tell. Maybe there was some unmentioned benefit for the natural allies as well. Maybe it was their attempt to become a capital side? I am not convinced of this. Loyalty, Duty, etc. have ratings. They can be altered. They can be messed with. 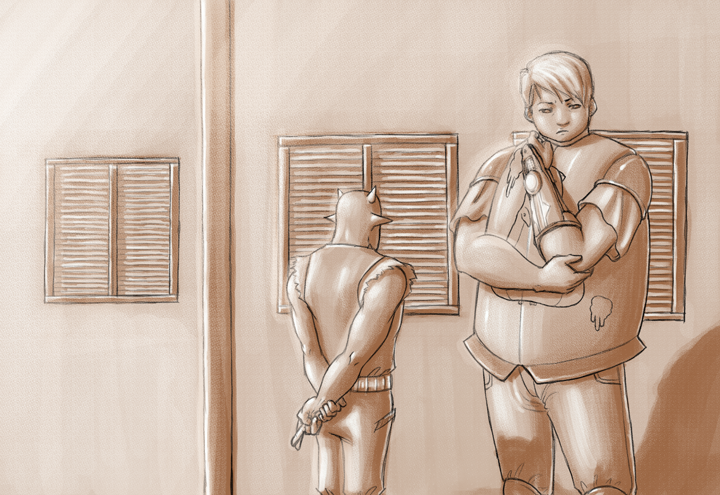 Units in Erfworld consider betrayals rare, but not impossible. Look at pre-decrypted Ansom. He never went "Wait - Stanley was GK's CW when Saline died. He couldn't have been involved", he went "Saline died! Stanley MUST have been involved!" I take Loyalty with a grain of salt. Take it up with the writer then, those are mostly his words regarding Duty. And I gave a possible out: If Stanely believed it was for the greater good he may be able to go along with it if not outright conspire against Saline. Also keep in mind that, according to Sizemore, the gobwins(and hobgobwins?) broke their alliance and Stanley had to come back and retake Gobwin Knob. http://www.erfworld.com/book-1-archive/?px=%2F079.jpg That gives more credence to Charlie given what we are led to believe he can do with natural alliances. Wanda is still in the game of course given her penchant for manipulation; magical and otherise. I wonder what the 'special mission' was that needed valuable casters being taken from the safety of a city.. perhaps that's not important. Of course, Sizemore could be lying, it could have been an elaborate plot wth Stanley and the Gobwins, it could also have been monkeys flying from Bogroll's zhopa as well but isn't it fun to wildly speculate? Personally I don't subscribe to this point of view. Sure it's fine to speculate. But lots of folks have demonstrated an ability to turn allies: Jillian and Vanna, Wanda, etc. We don't even know for sure that it was Charlie who turned the Giants. I think the text said it was his idea, but Jillian may have made the actual offer. Turning maybe rare or a big deal for a natural ally, but it still happens, and I think it happens a lot more than we know about right now. The evidence is far to circumstantial to implicate sides that weren't even known to be involved in the conflict at that time. My 2 schmuckers. All in fun for speculation too. He didn't. Level 1 cities pop infantry, and Level 2 cities pop warlords, according to Sizemore. Plaid units have a funny round nose that sticks out, croatons have triangular heads.